I love little crafts that you can make in less than an hour, don’t you? Oh, and even better if they help use up all those fabric scraps! 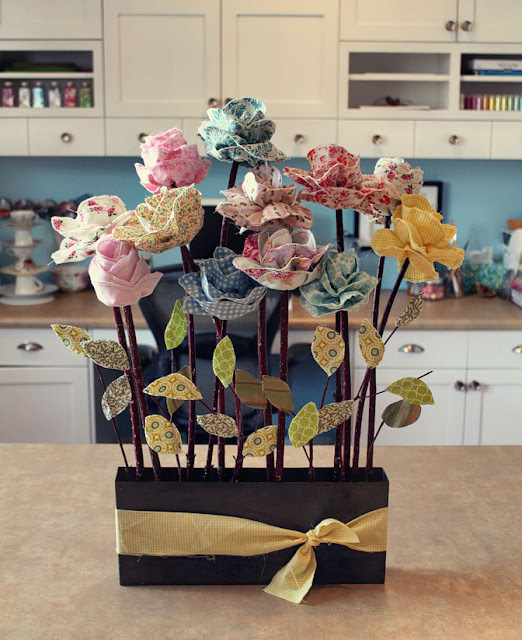 Check out these great tutorials for using small fabric scraps or strips to create beautiful blooming fabric flowers! 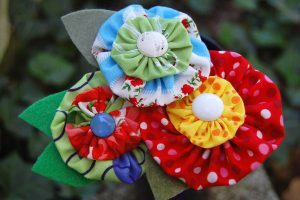 Learn to make bright and cheery Pop Garden Scrap Flowers from Heather Bailey at her blog, Hello my name is Heather! Bring a little fabric flower goodness to your home with these long-stemmed beauties from Anj at Snowy Bliss – find her tutorial right here. Aren’t these just lovely? And they never need watering! I have a thing for fabric yo-yo’s – and these stemmed flowers are made with a few different sized yo-yo’s and a shank button – get my yo-yo flower tutorial here. I also made some of these cuties as pins instead of stemmed flowers, and you can get an idea of how to stitch a safety pin on the back right here.